From here on out, I’ll be sharing mini product reviews, as well as quick tips and tutorials in a weekly to bi-weekly column here on Bows & Sequins. Keep an eye out for the Beauty Buff post titles, all of which you’ll be able to find by clicking the ‘Beauty’ category at the top of the website. On social media, I’ll group all of my posts with #BowsBeautyBuff for easy searching. Before we get started, I’d love to pick your brain a little bit — What do you want to see? What are some of your need-to-know beauty questions? What are some of your biggest beauty concerns — dark circles, dry skin, adult acne, redness, sensitive skin? What types of beauty reviews to you enjoy reading? And what types of reviews would you rather not read? I’d love to hear your thoughts to help shape this column into a something you look forward to reading, week after week! Now, on to the good stuff… Face masks! Face masks are my guilty pleasure. I’ve never been one to splurge on facials… I’ve seriously only had, like, five of them my entire life. But face masks make me feel like I’m bringing the spa home! I’m always one for instant gratification and face masks are one surefire way to see results on the spot. Quick side note on facials while we’re on the topic… I always feel like I somehow look worse after facials. I feel like extractions and I really don’t mix… I always feel blotchy afterwards, you know? Maybe I’ve just gotten not-so-great of facials in the past? They’ve been pricey and at nice places, though so I’ve wanted to assume that wasn’t the case. I’d basically come to terms with the fact that I’m just a rare breed — a skincare snob that hates facials. HOWEVER… Last spring before I moved, I realized I had a gift card to Sisley in the West Village in New York. I went on a rainy Sunday afternoon and OMG, I was glowing when I left. Even in the rain! Like I said, I had a gift card and they are pricey, but seriously — it’s worth the splurge! It was probably a good thing that I didn’t know how good their facial were the whole time I lived in NYC. Highly, highly recommend! I do face masks at least once a week! And more often than not, I do two masks in a row… A detox mask followed my a moisturizing mask. My skin is pretty dry, but can be prone to breakouts. Moisture is key! Whenever I do any type of detox mask, I’m always sure to do a moisture mask afterwards or slather on a moisturizing oil when I’m done. 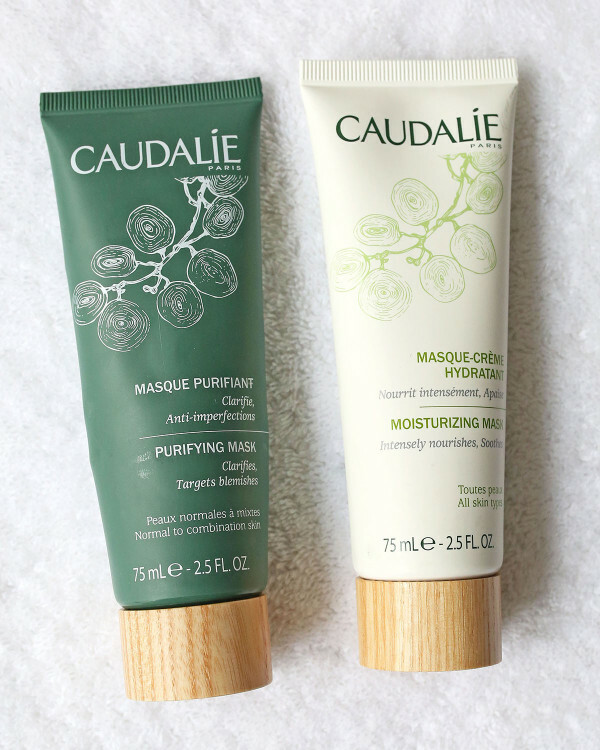 Caudalie is one of my favorite skincare brands. 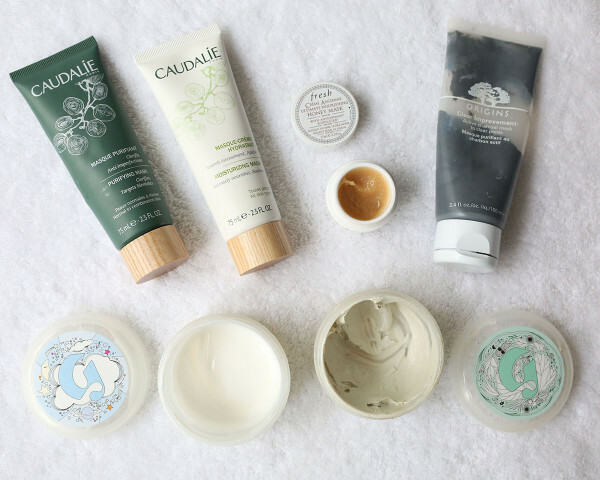 The Caudalie Overnight Detox Oil got me hooked two years ago and I’ve since tried a whole slew of their products — the Purifying Mask, the Moisturizing Mask, the Instant Detox Mask (which I just recently got and is not pictured here.. I love it so far, though! ), the Beauty Elixir (one of my travel must-haves! ), the Divine Oil, the Premier Cru Eye Cream, and the Premier Cru Cream. I’d highly recommend them all! These two masks about are game changers, seriously. Each tube is under $40 and you get a lot of applications from each tube, too! The Purifying Mask is a clay-like masks that works to target blemished and clarify your skin. The instructions say to apply twice a week for 10 minutes, but I always end up leaving it on my skin for probably closer to 30 minutes. No irritation! I always feel like I have a more even skintone and clearer skin afterwards. 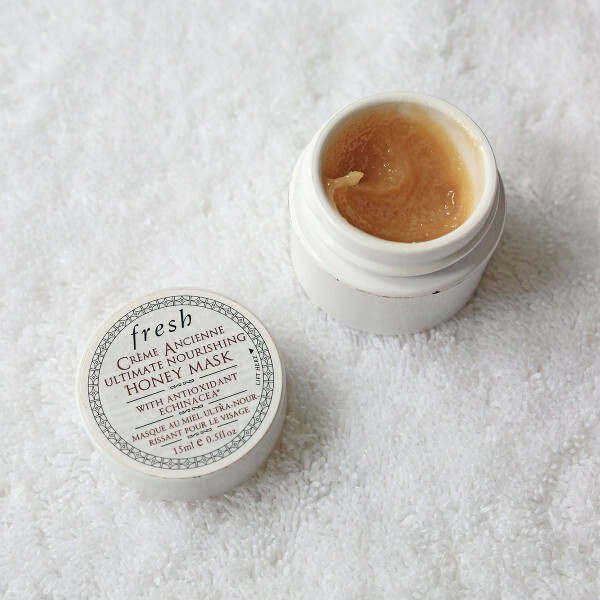 I love following this mask with the Detox Oil or the Moisturizing Mask! The Moisturizing Mask is absolutely amazing, too. The instructions say to “Apply twice a week to face and eye contours. Remove excess after 15 minutes or leave on all night.” I basically took that as “leave on as long as possible.” I’ll leave this on for hours at a time while I’m working or cleaning around my apartment at night. My skin feels so plump and definitely has a glow afterwards! 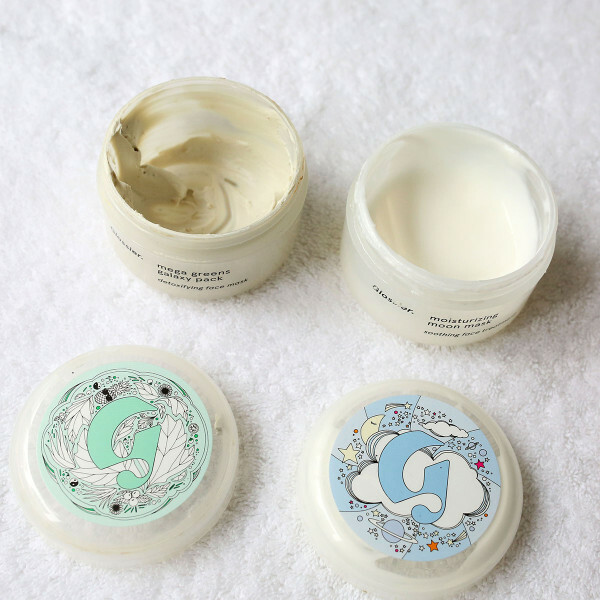 I think it actually might have been these two Glossier masks that got me hooked on masks a few years ago… It was love at first application! The price is insanely good (just $22! ), and these jars last for-ev-er. Glossier says the Galaxy Greens Detox Mask is like a juice cleanse for your face… The ultimate reset! I always feel like my skin looks clearer, but never red or irritated afterwards. It’s great for my sensitive skin. I leave it on for 20-30 minutes each time. The Moisturizing Moon Mask so soothing. My skin feels dewy and bright whenever I’m done! I apply it for 20-30 minutes, or sometimes up to an hour to soak in all of the extra moisture. I love applying these two as a two-step set! You can get 20% off the Glossier site using this link! Laneige Water Sleeping Mask: I recently just tried this mask a few weeks ago and have used it a few times since. It’s great for the price… You can find it at the drugstore! My only qualm is that I was worried about my sheets (I love my Boll & Branch sheets!) so I made sure to apply with ample time before turning out the lights. It soaks into your skin and feels soft, rather than sticky. By the time I turned in, I wasn’t worried about it. My skin felt very plump and moisturized in the AM! I’ve also read that you should layer your serums under this product before you hit the sheets… It’s totally fine to use both! What are some of your favorite masks? I’d love to add some new ones to my must-try list! Have you tried any of the masks mentioned above? Can’t wait to hear your thoughts! Love this! I am turning 30 this year, so I am always on the look out for new anti-aging products and anything that will help my skin look fresh! You aren’t alone on the facial front, I enjoy them, but I feel blotchy for at least a day, then I notice better skin. So weird. I just got Aztec Secret Clay off Amazon for a big tub $9 bucks! I’m dying to try it tonight. It is Indian Healing Clay….Most powerful facial??? In my mind, it is the SAME as the other charcoals on the market without the mark up. We’ll see. The verdicts out…. Ironic that I just did a search on your blog yesterday for face mask recommendations! Dermalogica has GREAT skin care products also; you can pick up their stuff at Bluemercury. I’m obsessed with their sebum clearing masque. ‘Hello Flawless!’ Oxygen Wow liquid right now and while I love the initial coverage, it comes off quickly. 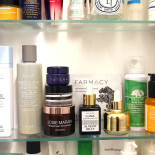 I’ve been on the hunt for a good retinol product, too – once I turned 30 skincare became super important. I just bought the Origins charcoal mask and can’t wait to try it! Product reviews are always appreciated. The Origins charcoal mask is my favorite. I have even found that spot treating acne with it works wonders in combination with some actual spot treatment. I love hearing beauty routines on blogs – your five minute face vs. your glam party look. Hair product reviews are welcome also. As for topics, dark circle tips are always appreciated! I’m excited about this new series. I heard the origins charcoal mask is really good! Great post! First of all (and only because you mentioned it) I love love love your Snaps; they’re really fun to watch and I like that you kind of do a lot of “behind the scenes” of B&S; it’s great, seriously, keep it up! On another note, I love the idea of this series because I’ve been pretty deep into skincare lately (kinda obsessed), so it’s always helpful to have many points of view… The Origins Charcoal Mask is a MUST!! Also, Glamglow masks are pretty great (a little bit more pricey, but definitely worth it), they’re mud masks and there’s 4 different treatments to choose from; and if you’re into sheet masks, check out Florapy, they’re life changing and definitely not your average sheet mask (say goodbye to those ugly paper masks!). Thank you for this posts and your masks recommendations! I’ll be definitely adding those to my list. I personally love Murad’s clarifying mask, it’s the first one I ever used that I noticed a difference in my skin after. Now I’m much more conscious about chemicals I put on my skin, so I try to use more natural brands. I love the blue clay mask from Herbivore, and the charcoal mask from Cold Spring Apothecary! 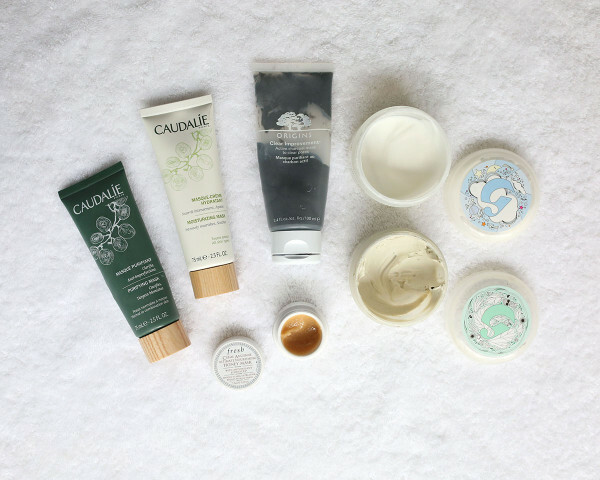 I am OBSESSED with skincare… especially Asian skincare. Laneige is a godsend when it comes to sleeping masks. Another amazing mask is Caolion’s pore pack duo and sheet masks from Leaders. Ok, I’ll stop now. I’m getting too hyped over skincare haha. I have the sleeping water mask by Laniege. Definitely need to look into these others! I would love to see some sunscreen options you use. I’m on the hunt for good sunscreen and any extra opinions I can get is ideal! I love my eyebrows and sometimes they are all I need to do for my makeup routine. What would you recommend to fill in dark eyebrows. Is pencil, gel, or powder better? I am trying to decide what to try next. I have very dark eyebrows and I use a pomade or a pencil! Do you have a link/code for Glossier? I wouldn’t mind 20% off, and apparently you benefit get $10 if I use one from you. I really want to try out one of both of the masks! Wait!? Who is your eyebrow lady in Chicago?! I would love a recommendation in the city. Dayna DeLaurentis at Exfole8 (West Loop) will change your mind about facials. She is a fair price and knows her stuff. The shoulder and neck massage will ruin you forever.